When you put the word "hop" front and centre in your name, you're going to want to know your way around them in the brewery. And Hop Nation has certainly proved they do, particularly since moving into their own home in Footscray. 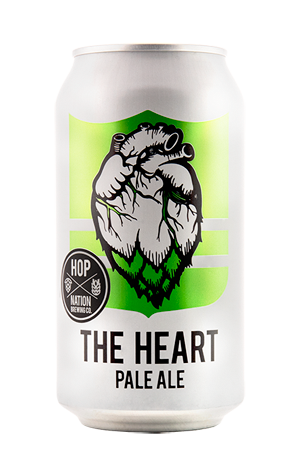 Having released all manner of hop forward beers – IPAs, an American red, a Kiwi pilsner – they added a pale ale to the lineup too, with The Heart so called as founders Sam and Dunc reckon it's at the heart of their brewery. It's a pale as pale, one that throws out big lime and kiwi fruit aromas that are followed up by a wealth of citrus and tropical hop flavours. It's another beer that displays their happy knack for getting plenty out of New World hops and comes in typically good-looking cans too.